When it comes to caring for the elderly, nursing homes have long been the “best” option for people to take advantage of. While this has been the case in the past, there are far better options for your loved ones, and one of them is in-home healthcare. There are countless ways that the elderly benefit from allowing them to stay within the comfort of their home. 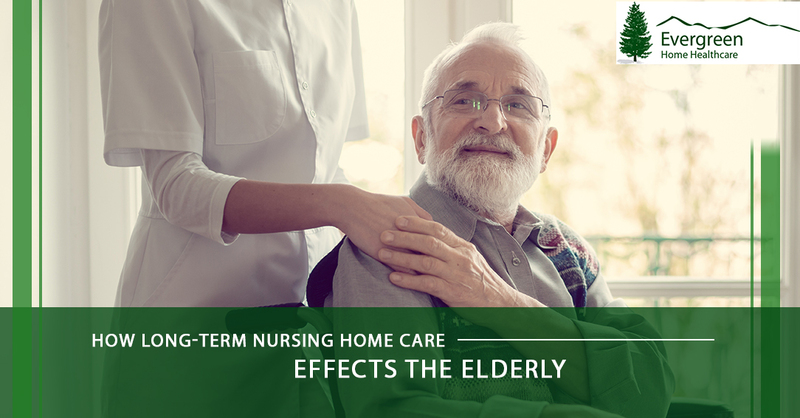 Though many would argue a nursing home is equally as beneficial, there are a few ways that long-term care in a nursing home can affect the elderly, not necessarily in a positive way. Keep reading to see a few of the ways that long-term care could be affecting an elderly individual in a nursing home. One of the most prominent ways that the elderly will be affected by long-term care in a nursing home is the loss of independence. While it may seem like a choice that is made, it’s relatively difficult to have a sense of independence when you’re in a nursing home and being taken care of around the clock. From preparing meals and bathing to exercise and social interactions, nursing homes provide a very structured and guided sense of care to the elderly residing there. This is a struggle that most elderly notice upon their arrival at a nursing home, but slowly give into. Eventually, it can become challenging to prepare meals for themselves, get dressed, or take the initiative on their own. So, while it may seem like a method of care, the choice to place your loved one in a nursing home could ultimately lead to them becoming more dependent on help. Rather than letting this be the case for your loved one, provide them with an in-home professional that can assist when needed. This ensures that they are safe and have care, but will still provide your loved one with their independence and the ability to care for themselves when they’re able to. While there’s no direct evidence that being in a nursing home for long-term care can cause depression, there has been a high correlation between the two. Whether it’s the lack of independence, the uprooting from home, or a combination of the above, it has been shown that individuals in long-term care facilities are more likely to develop depression. Rather than risk this happening to your loved one, ensure that they have the care they need without having to give up their home or lifestyle. In-home health care is one of the best ways to make this scenario a reality. A major misconception of at-home healthcare is that it costs more than a nursing home does. Given that one-on-one care is incredible and has so many benefits, we can understand why people think this, but it’s far from reality. Nursing homes are costly, and when you’re considering this a solution for long-term care, it can add up — quickly! Whether this is coming out of your pocket or is the savings of your loved one, nursing homes can quickly affect the financial well-being of the parties involved. Before committing to this because it seems like the more affordable selection, weigh all other care options before committing. There’s a good chance you could provide your loved one with a higher quality of living for less money. At-home healthcare can save you quite a bit of money given that you’re primarily paying for the care that the professional is providing. You don’t have to worry about the additional cost of the facility since they’ll remain in the comfort of their home. This makes up a majority of the price when you look at what nursing homes are charging, and taking that out of the equation could save you some serious money. If you have a loved one that is in need of some help here and there, but you’d like to prioritize their comfort and emotional needs, at-home health care is an option to consider. Evergreen Home Health Care can provide you and your loved one with the home healthcare services that you need. Our team offers a selection of home health care services to the Denver and surrounding areas. If you’re interested in learning more or getting your services scheduled, contact our team and we’d be more than happy to get you taken care of.